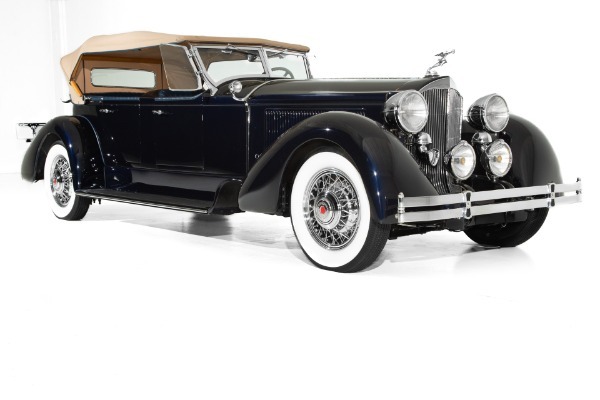 Automotive Masterpiece, Frame-Off Restored 1930 Packard, LeBaron Custom Dual Cowl Phaeton is a 640 Series Packard according to the vin number 169749. This amazing car is sitting in the entrance of American Dream Machines, a building that was originally built as a Packard dealership in 1929. 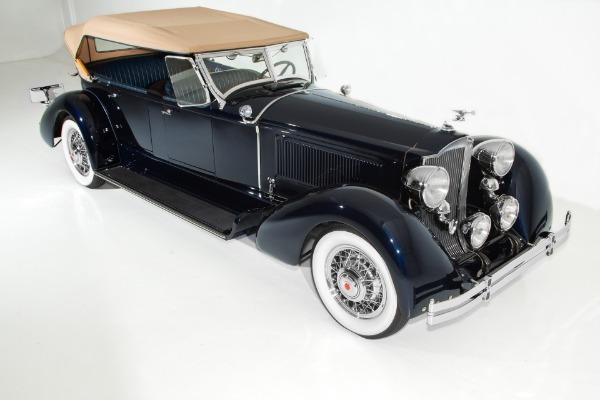 According to the two previous owners over the last 30 years, this incredible car was a once in a life time barn find that was restyled by LeBaron Body Company many years ago in 1932 and later meticulously frame off restored over a 12 year period. 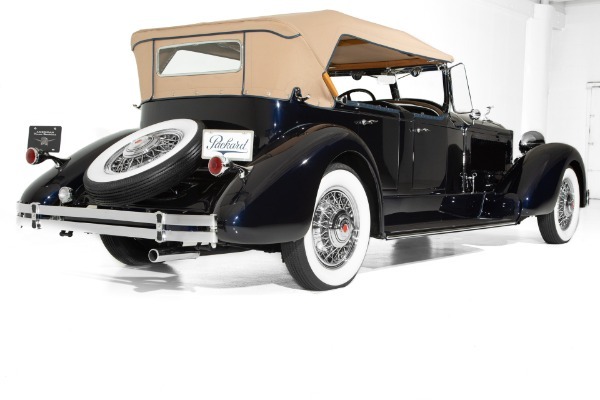 This prestigious Packard Custom Dual Cowl Phaeton was created during the golden age of American Coachcraft, when Brewster, Darrin, LeBaron and Fleetwood created handcrafted coaches onto the original manufacturers chassis to produce the worlds finest automobiles. 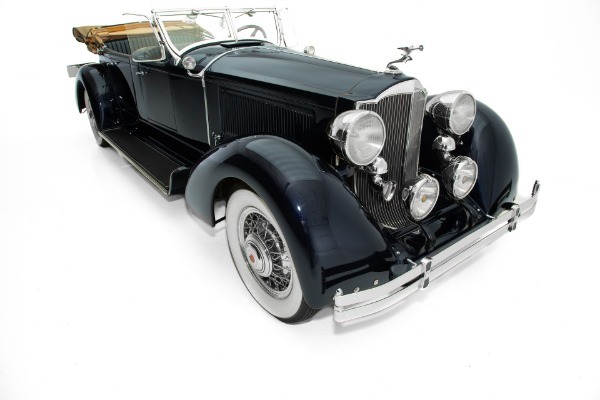 This stunning LeBaron body incorporates hand formed fenders and body design features similar to those of LeBaron Carrossiers, world renowned for their design and coach built bodies on Locomobiles, Mercedes-Benz, Peirce-Arrow and Delage. This magnificent car was disassembled into hundreds of pieces and reassembled to the gorgeous investment quality car that is is today. It is truly one of a kind. The exquisite Midnight Blue paint was just finished with less than 5 miles on the car since the re-paint. 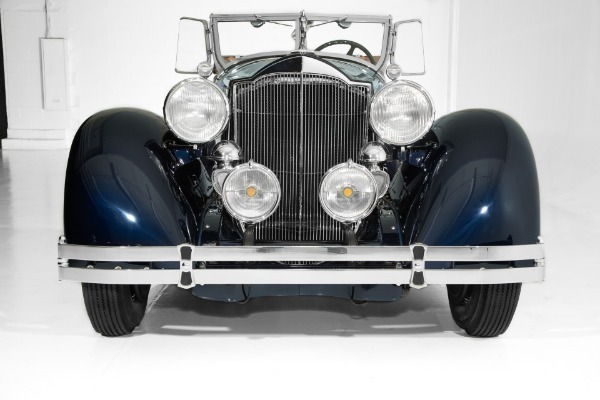 This gorgeous car received the 12 year nut and bolt frame frame off restoration with every piece of chrome and stainless re-chromed or polished to perfection, including bumpers front and back, headlights, chrome windshield, side windows and glass, tail lights, door handles. 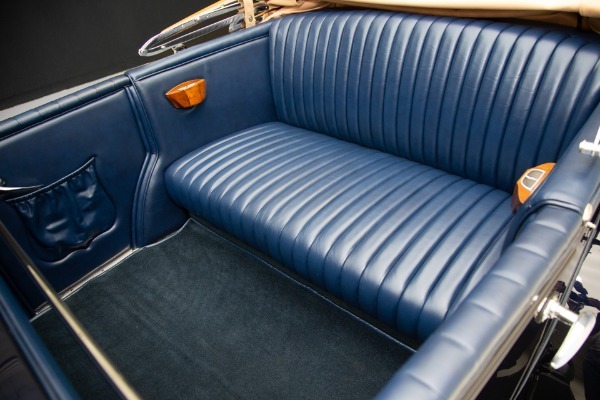 The initial restoration was completed around 20 years ago, was driven sparingly and has had very few miles since. 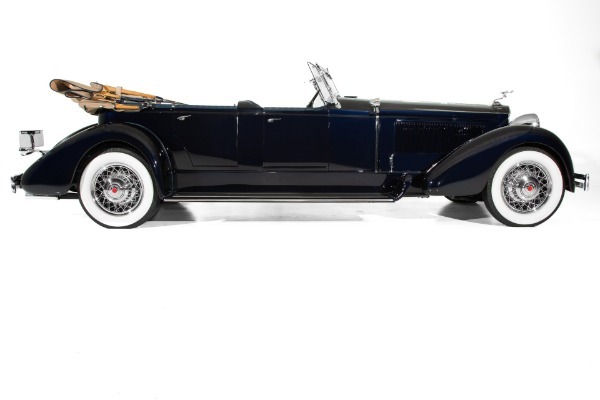 When we received the car, it was already professionally frame off restored, but the paint had a few different shades of white and had color match issues, so we decided to disassemble the body again and give the car the professional paint job it deserved, in a stunning shade of midnight blue. The paint looks black until shimmering in the sun, giving the car slight glimmer of blue. 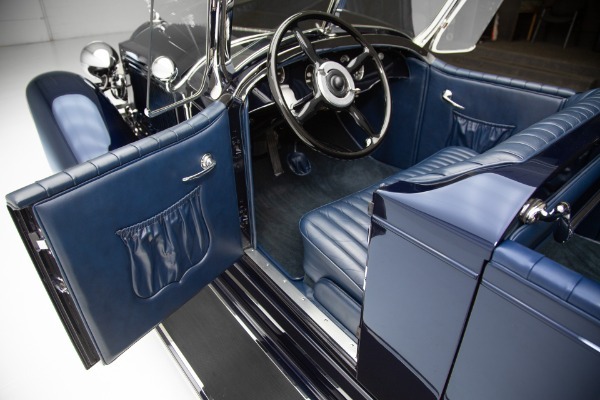 At the time of the extensive restoration, the interior was redone with new leather hides, door panels, convertible top, wood and chrome hardware and refurbished gauges with chrome bezels. 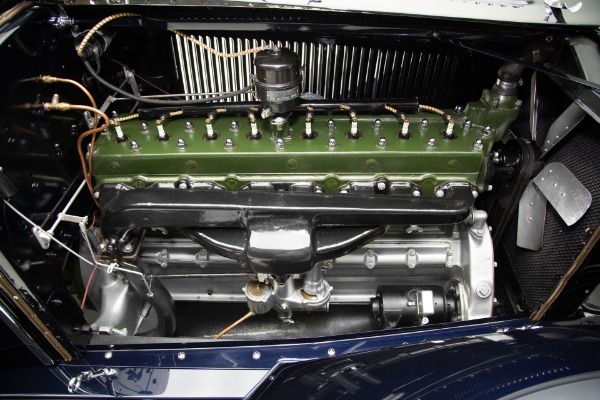 The Packard 384 cubic inch straight eight L-head engine boasted 135 horse power with 3200 rpm which was built for speed at the time, topped off with a Detroit lubricated updraft carburetor for speed in excess of 100 miles per hour. 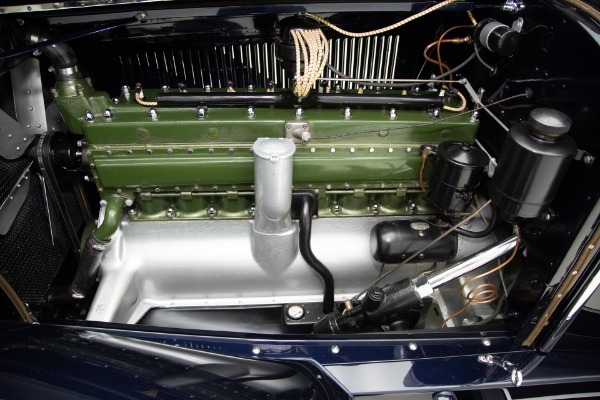 The vin #169749 is clearly stamped in the engine equates to a late 1929 640 Series Custom Dual Cowl Phaeton engine that would be correct for an early 1930 body. 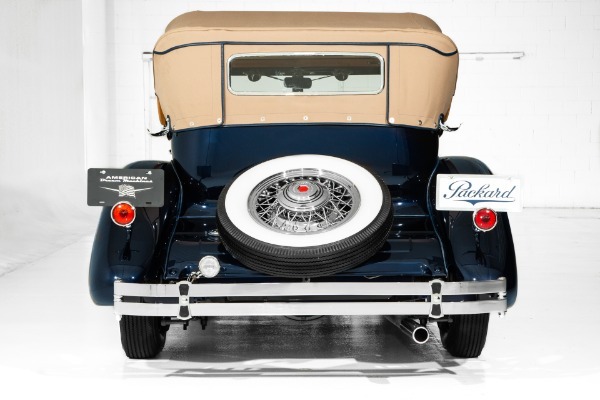 This 142 inch wheel base automotive masterpiece is launched by a 3-speed transmission, backed by Hypoid-Gear rear differential and stopped by the Packard heavy duty 4 wheel mechanical brake system, rolling on Packard wire wheels, wide whites and a continental spare on the back. 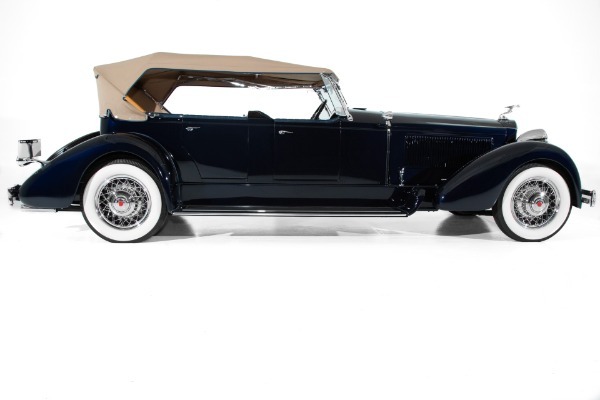 Vin #169749 validates the authenticity as a 640 Series, Packard Custom Dual Cowl Phaeton body from the factory. "Packard was an American luxury automobile marque built by the Packard Motor Car Company of Detroit, Michigan, United States. The first Packard automobiles were produced in 1899, and the last true Packard in 1956, when they built the Packard Predictor, their last concept car. Packard bought Studebaker in 1953 and formed the Studebaker-Packard Corporation of South Bend, Indiana. The final Packards were actually badge engineered 1958 Studebakers. From this beginning, through and beyond the 1930s, Packard-built vehicles were perceived as highly competitive among high-priced luxury American automobiles. 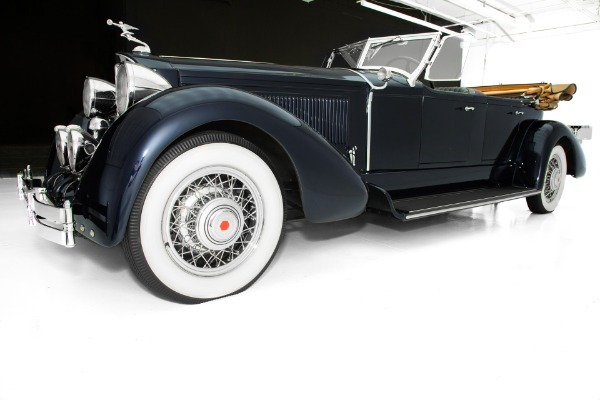 The company was commonly referred to as being one of the "Three Ps" of American motordom royalty, along with Pierce-Arrow of Buffalo, New York and Peerless of Cleveland, Ohio. 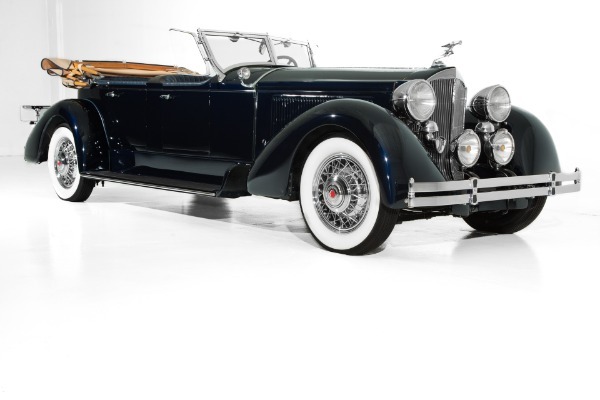 For most of its history, Packard was guided by its President and General Manager James Alvan Macauley, who also served as President of the National Automobile Manufacturers Association. 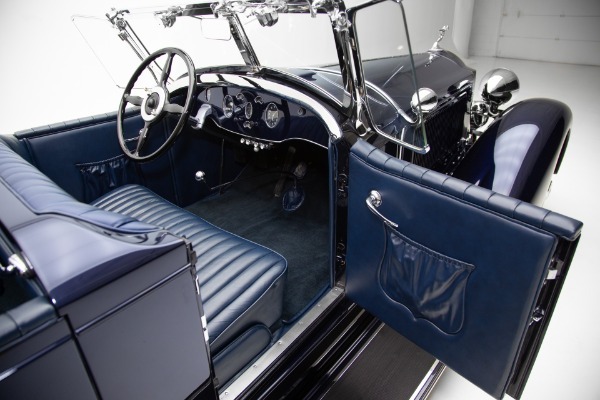 Inducted into the Automobile Hall of Fame, Macauley made Packard the number one designer and producer of luxury automobiles in the United States. The marque was also highly competitive abroad, with markets in 61 countries. Gross income for the company was $21,889,000 in 1928. 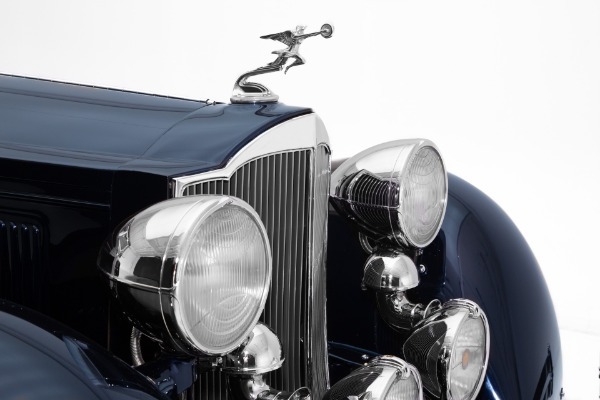 Macauley was also responsible for the iconic Packard slogan, "Ask the Man Who Owns One". In the 1920s, Packard exported more cars than any other in its price class, and in 1930, sold almost twice as many abroad as any other marque priced over $2000. 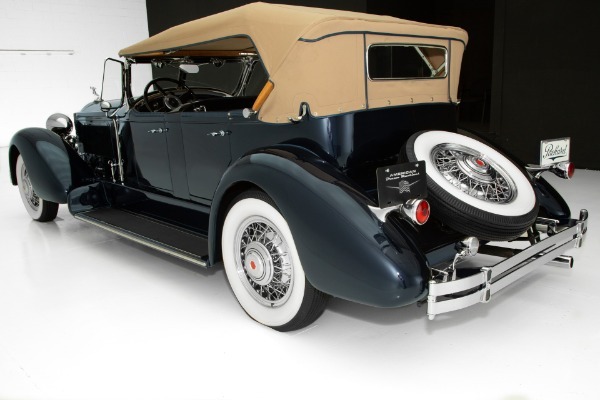 In 1931, 10 Packards were owned by Japan's royal family. 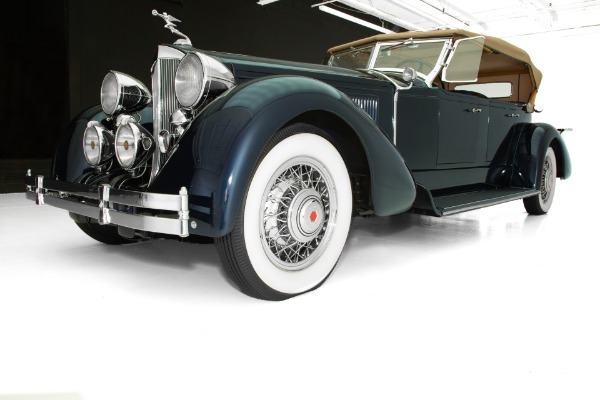 Between 1924 and 1930, Packard was also the top-selling luxury brand." 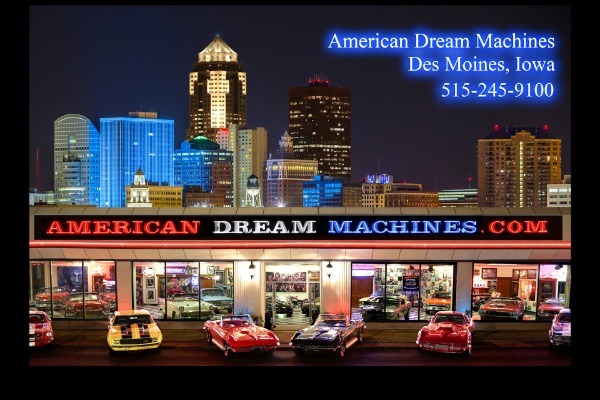 At American Dream Machines, we typically have over 100 quality classic cars and trucks in stock and for sale. We have everything from Corvettes to Cadillacs, Camaros, Mustangs, Mopars, GTOs, Chevelles, Bel Airs, Blazers and exotic sports cars. 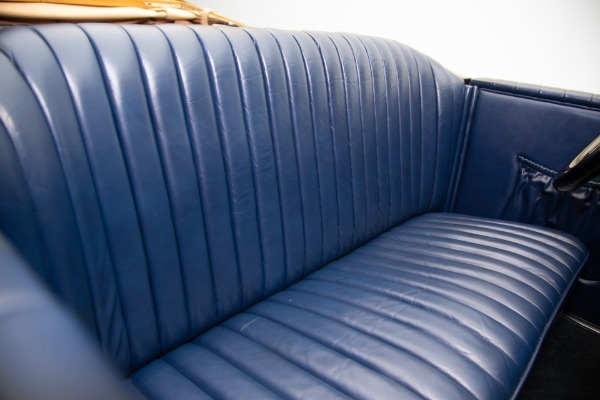 Our classics and muscle cars range from the 1950s to the 1970s. Our inventory is diverse and continuously changing and always growing! Our #1 Goal is to make you, our customer happy with the American classic and muscle cars we offer. 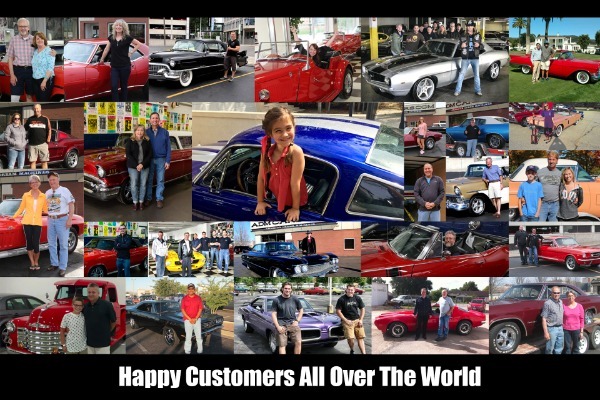 We highly recommend that ALL CUSTOMERS call our knowledgeable, experienced staff and with Midwest values and have very detailed discussions regarding overall condition of any of our classics that you are considering getting in the drivers seat of. Our phone number is 515-245-9100 and we are centrally located in the heartland of America, in Des Moines Iowa. American Dream Machines occupies the historic 41,000 square foot Packard Dealership. 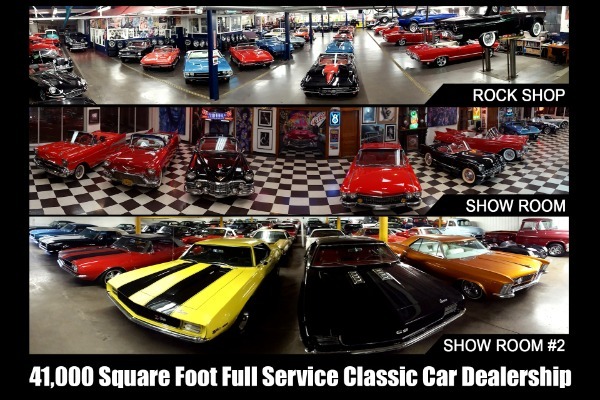 We are one of the largest full service classic car dealerships in the Midwest. We have over 10 active Mechanic hoists, a body shop and detail bays that are used by our technicians to inspect, repair, upgrade and detail our cars so that they are ready to be delivered to your driveway. Please give us a call and we will be happy to help get your dream car to almost any location worldwide! ALL OF OUR PICTURES AND VIDEOS ARE REAL, ALL THE WAY AROUND! 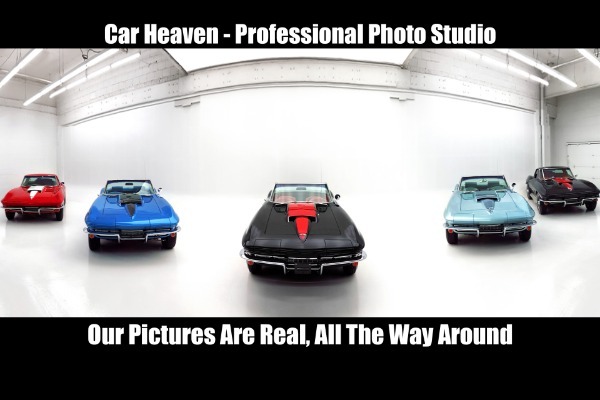 We photograph our cars in our professional photo studio for the best possible image accuracy and representation of the cars. We do this because of our commitment to the authenticity and quality of the cars we sell and commitment to our customers. We are very proud of the name American Dream Machines and it is a registered trademark for our company.